Made my sister and me get out of the car on the main road several times to pick up debris so other cars wouldn’t be damaged by it (it was a small town, so we weren’t in danger of being hit!) As my Brownie leader, she brought the whole troop out regularly to pick up litter on the side of the same road… long before the Adopt-a-Highway program came about. Was an enthusiastic reader. Everyone at the public library knew her. Didn’t hesitate to do things she was interested in, even alone. She couldn’t get anyone else in the family excited about collecting coins or stamps, but she went to coin and stamp shows, pursued genealogy and other things she enjoyed. Was an early feminist. I remember in the 70s that she ordered return address labels for herself (a married woman) with Ms. before her name. Was an avid exerciser. She worked out with Jack LaLanne on TV when we were kids and walked 3 miles a day for more than 35 years, into her 80s. Today, at near 90, she still exercises daily along with a TV fitness show, rides a stationary bike in the garage and cruises around the neighborhood on a three-wheeled bike. Insisted I write thank you notes. Supported me 110 percent in everything I attempted. Told me I could do anything I set my mind to. And I believed her. You can draw your own conclusions about my personality traits today (the good ones, at least) — and conclude I’m the women I am today because of my wonderful mother. *I was inspired to write this blog post after reading about Skirt! 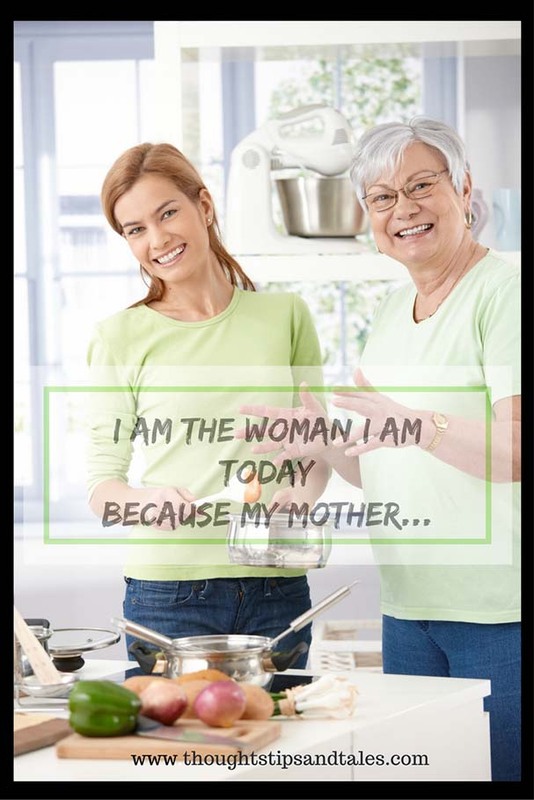 magazine’s contest: I Am the Woman I Am Today Because My Mother… Why not write an entry yourself and email it by the March 1 due date? See details here. This entry was posted in friends, life, miscellaneous, moms and tagged i am the woman i am today because my mother, life accomplishments, moms, mother's influence, my mother, personality traits, positive influence of mother. Bookmark the permalink. What a beautiful story. You are blessed to have such an amazing mom!